Stories of fighting captains and admirals fill histories and novels alike but, though ships and fleets may win battles, shipyards win wars. A nation's navy is merely a snapshot in time of its maritime military power, while a country's shipyards constitute its strategic, forward-going strength. Shipyards repair damage so that ships can fight again, replace ships lost in battle, and incorporate new technological advances and battle lessons learned. In fact, at any point in time few ships in the fleet contain all the latest technologies, but a shipyard must have every one of them and the tools to add them. 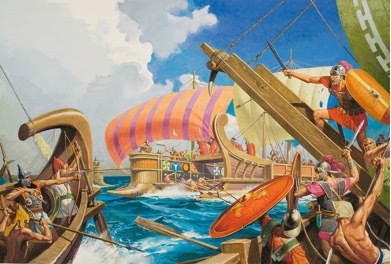 Imagine the Carthaginians' dismay in the next battle (Mylae) when odd-looking vertical boards pivoted on their masts and suddenly plunged down onto their decks, locking the ships together (Corvus is "crow,” named for the steel "beak" on the bottom) for a century-strong boarding party of Roman legionnaires to storm across. The result was a great Roman victory, including the capture of some thirty Carthaginian ships. Unfortunately, the Romans soon lost that fleet, but built another. They continued to repeat the process, implementing new techs as they went. In fact, it would be the fifth Roman fleet that beat Carthage and forced them to sue for peace. Thus, the Roman shipyards ultimately won that war. One analogous situation in science fiction would be Walter Jon Williams' excellent Praxis series. In the opening novel, a multi-thousand-year-old space empire falls into civil war. The fleets of the two sides suffer almost mutual annihilation in the very first battle. From there, it is as much the race between shipyards as it is the space battles that decide the conflict. An even more dramatic case from history was the Venetian Empire. From the Middle Ages until about the time of Columbus, Venice dominated the Mediterranean through a combination of military power, trade, and diplomacy. A key player in the Venetian success was the Arsenale shipyard which—by using parts prefabrication and assembly line practices on a scale that would not be matched until Henry Ford—could build a warship in a single day. Indeed, Venetian officials would invite visiting dignitaries to witness the process for themselves. (Footnote 1) The Arsenale shipyard was so intimidating that it actually prevented wars! As the size of warships and the scale of wars increased, so did the importance of shipyards. Shipyards became global players as tensions rose before World War I when many nations including Brazil, Argentina, Japan, Greece, and the Ottoman Empire all ordered dreadnoughts from the yards of Britain and Germany. Of those nations that bought warships, only Japan would invest in major shipyards and, by doing so, become a major naval power in its own right. (Footnote 2) The British yards would outbuild the German ones by such a margin that the strategic Battle of Jutland (May 31, 1916) would be fought nine versus five in battle cruisers and twenty-eight versus sixteen in dreadnought battleships, with even larger ratios in cruisers and smaller ships. Why don't more stories feature yard workers as major characters? Perhaps their roles lack excitement? Tell that to the yard workers who were aboard HMS Prince of Wales when she and HMS Hood fought KMS Bismarck and KMS Prinz Eugen in the most famous Atlantic naval action in World War II. The Prince of Wales was such a new ship that her two quad turrets (which housed eight of her ten main guns) still did not have all the bugs worked out. Not only did one hundred civilian technical experts from Armstrong Vickers sail with the battleship, but they were also credited with helping to keep her guns firing (Footnote 3). Even with their efforts, the British battleship's eighteen salvos during the critical engagement fired only fifty-five of the seventy-four rounds that should have been fired. The three hits those salvos achieved led the German warship to break off action and attempt a return to port. Meanwhile, the Prince of Wales (and the Armstrong Vickers' technicians) had been hit by three fifteen-inch shells from Bismarck and four eight-inch shells from Prinz Eugen. Yard workers were also aboard the key warship during the most famous Pacific naval action: The Battle of Midway. Instead of finishing construction, this time they were still repairing previous battle damage and the account reads like a novel all by itself. Claude Sexton Gillette almost certainly spotted the ten-mile-wide oil slick trailing behind USS Yorktown (CV-5) before his plane touched down on the crippled aircraft carrier on May 26, 1942. After all, that was part of the reason why he was there. 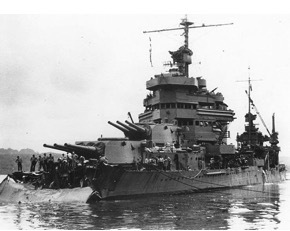 Admiral Nimitz, who was the Commander-in-Chief of the Pacific Fleet, had dispatched him upon reading the Yorktown's damage report that had been delivered to him by plane a day earlier while the carrier was still many miles from Oahu, limping home at her best speed of about twenty knots. The damage had been inflicted on May 8 during the Battle of the Coral Sea and included multiple compartments destroyed by a bomb that had punctured the flight deck and exploded fifty feet inside the ship. The machinery for one plane elevator was badly damaged, the radar and refrigeration systems were lost, and lighting was out on portions of three decks. Eight near misses had ruptured three fuel tanks and opened seams in the hull. Rear Admiral Aubrey Fitch, who was aboard the damaged carrier, had reportedly estimated that repairing the Yorktown would take ninety days. Based on coded intercepts, Nimitz knew he didn't have ninety days; he had three. Captain Gillette, manager of the Pearl Harbor shipyard, was hardly a stranger to battle damage and the challenges of effecting repairs. In fact, he and the team that he brought along might have been the most experienced experts in the world with respect to naval bomb and torpedo damage. Gillette had held his post at Pearl Harbor since before the Japanese attack on December 7, 1941. Already one of the top engineering duty officers in the U.S. Navy before the war began, he and his shipyard had been doing nothing but repairing warships ever since. Gillette radioed back to Nimitz that Yorktown could be repaired, but that it would take a supreme effort. The work began even before the carrier arrived, as yard workers started prefabricating bulkheads and other structural elements while the Yorktown was still at sea. The carrier entered Pearl Harbor the afternoon of May 27, and shipyard workers poured aboard. They would work nonstop until she left. Early the next morning, the carrier was in Dry Dock #1 and, with at least a foot of water still being pumped out, Admiral Nimitz was among those sloshing about in waders to inspect the hull damage. Nimitz spent some time staring up at the burst seams and other damage. Reportedly, he then turned to the senior yard officer present and said, "We must have this ship back in three days." Hull repair expert Lieutenant Commander H. J. Pfingstag gulped and said, “Yes, sir.” Six months earlier, Pfingstag might have said it was impossible, but that was some thirty-five bombs and torpedoes ago. Gillette and the Pearl Harbor Naval Shipyard took on the Yorktown repair effort not only with hard-won expertise, but also with massive brute force. They didn't have enough time to repair all the hull seams, so they welded an enormous steel plate over the entire damaged section. The size of the yard force was also unprecedented, numbering some fourteen hundred, all working round-the-clock. The effort required so much electricity that the Navy contacted the president of the Hawaiian Electric Company, who arranged a series of rolling blackouts in Honolulu. The shipyard workers literally poured the industrial power of a major city through their tools and into USS Yorktown. Yorktown left Dry Dock #1 on May 29, and steamed out of Pearl Harbor early the next morning with hundreds of yard workers still aboard. Some would disembark later while the carrier refueled, but about a hundred would remain aboard. With the arrival of USS Yorktown, the U.S. Navy had near-parity in carrier planes. She would bear all the attacks during the decisive Battle of Midway. The first Japanese wave hit her with three bombs, holing her flight deck and rendering her dead in the water. The second wave arrived an hour later, but assumed they were attacking a different carrier, because repair teams (including the remaining yard workers) had already gotten Yorktown back to 19 knots. They then hit the damaged carrier with two torpedoes, causing her to lose all power and develop a list, but she would probably have survived to return to Pearl Harbor except for a submarine attack days after the battle. 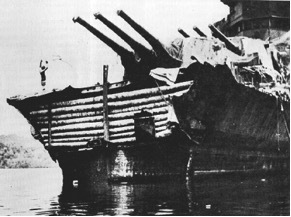 The Japanese would lose four carriers during the battle. Even as USS Yorktown bore all of the enemy attacks, her air groups sunk one enemy carrier (Soryu); one of her spotter planes found the last one (Hiryu); and ten of her dive bombers (flying off USS Enterprise) participated in its sinking. Yorktown would not have even been there except for Captain Gillette and the Pearl Harbor Naval Shipyard. Figure 2. USS Minneapolis and her coconut logs temporary bow. Both ships would jury-rig temporary bows and get to shipyards. Minneapolis would use coconut logs for part of the bow, and the more damaged New Orleans would steam backwards all the way to the Puget Sound! Both would return to service in about nine months. The Japanese thought they were destroyed; the shipyards sent them back to battle to prove them wrong. Throughout World War II, shipyards regularly upgraded warships to incorporate new technologies (such as radar) and new weapons (such as replacing pre-war anti-aircraft guns with 40 mm Bofors). American submarines had many of their external elements removed when it was learned that they increased the vessels' underwater noise signature. Thus, shipyards constantly improved the combat power and survivability of American ships such that the longer warships were away from a shipyard, the further they were behind technologically. This aspect was a key theme of Joe Haldeman's novel The Forever War, in which relativistic velocity time dilation greatly extended the time from ship departure and arrival in combat zones. That is, a state-of-the-art warship would be many years behind the enemy because the defenders would always be fighting nearer their shipyards. Similarly, the human force that fought the climactic battle in Orson Scott Card's Ender's Game was comprised of the oldest and least advanced ships because they had been dispatched earliest. The U.S. Navy's use of modules has recently been expanded to include temporary "mission packages" that can be changed to fit ship assignment. 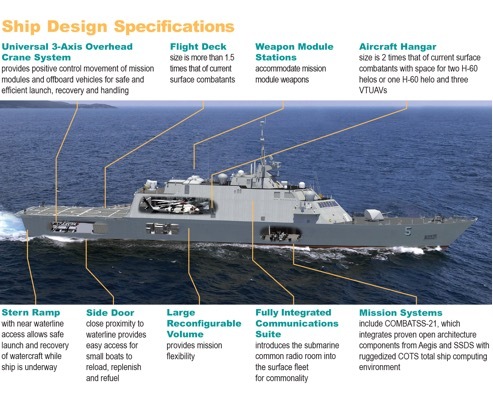 This concept was a key design element of the new USS Freedom and Liberty littoral combat ship (LCS) classes. 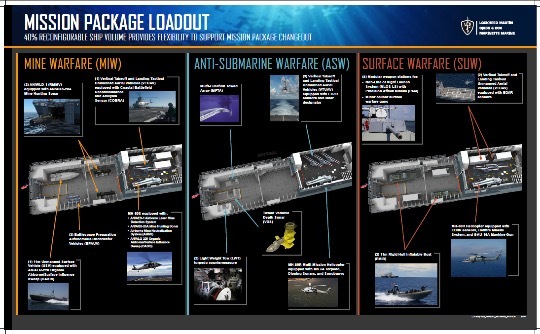 The LCS designs allow different equipment configurations for different mission profiles—including surface warfare, mine countermeasures, and anti-submarine warfare—with the mission-specific components able to be swapped out quickly at a yard. In the figures below, note the design flexibility features such as open software architecture, internal crane system, and reconfigurable volumes, and how specific mission package modules make use of those features. One can view the remote controlled, twin 30 mm cannon modules arriving and being installed on USS Freedom here (https://www.youtube.com/watch?v=QjG_dBUehAk) (between time 2:30 and 2:45 in the video). 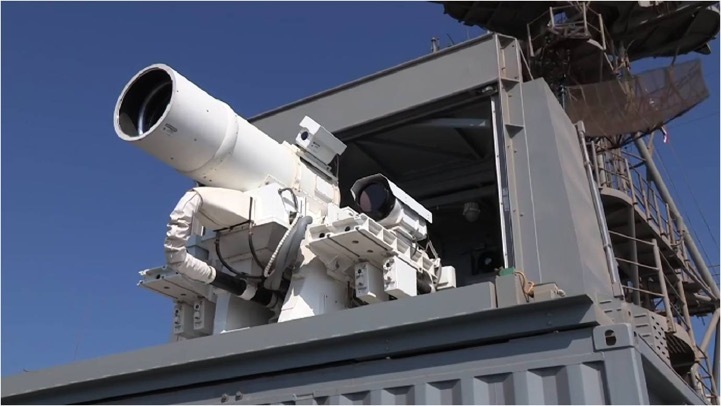 Looking into the near future, consider the laser mount that has been both developed and deployed aboard USS Ponce (AFSB(I)-15). The laser system can be seen in action in the demonstration video here: https://www.youtube.com/watch?v=sbjXXRfwrHg. Such mounts will likely be engineered into modules and retrofitted into the fleet. Turning to science fiction, A. E. Van Vogt addressed some of the potential implications of the massive industrial complex that would be necessary to build a major space warship in the short story "The Sound" (1950). In that story, the extreme complexity and long duration of construction led to children growing to adulthood knowing they were destined to crew the vessel upon completion. Like in many other older works, the ship was described as being built on a planet, leaving aside all the many and serious gravity well problems associated with such a massive object (let alone lofting it into space). More recent authors have avoided those issues by writing shipyards as spaceyards in orbit around planets or in asteroid belts. One exception is David Drake's excellent Leary series (first book: With the Lightnings), in which he carefully crafted a design rationale in his storyverse that allowed it. This series is also notable in the current context because one shipyard is a family business and the main characters spend so much time there that the yard practically becomes a character in its own right. Another exception is the Destroyerman series by Taylor Anderson (first book, Into The Storm), in which a shipyard becomes an agent for social change. Spaceyards allow weightless transport of materials and zero-g assembly. This would be crucial when one considers that the ships are generally postulated to be many times the mass of the USS Gerald R. Ford. For example, the mass of Captain Kirk's Enterprise was more than twice that of the nuclear aircraft carrier of the same name and later Starfleet vessels got even larger. Large space fleets of massive warships have long been a science fiction staple, but Dave Weber's Honorverse is one of the few that has addressed the full importance of the facilities that build them. The entire plotline of his Flag in Exile (Spoiler Alert!) involves a wartime military campaign by one star nation to capture a shipyard to close the technology gap enjoyed by its foe. Remember, shipyards are the only places that must contain all the most recent tech because it is there that ships are refitted and modernized. Thus in Flag in Exile, a shipyard is properly written as a strategic level prize fully worthy of major fleet maneuvers and battles. The Minotaurs are far from the largest warships in Weber's "Honorverse," however, as "super dreadnoughts" routinely massed over eight million tons, and the shipyards of the story's Star Kingdom built over four hundred of those vessels! Author David Weber provided some dimensions for the capitol system shipyard (Hephaestus) and the numbers are astounding! Despite the enormous investments needed for an Hephaestus-size shipyard, any star empire fielding fleets cored by hundreds of multi-million ton capital ships would require just such a level of support infrastructure, whether centralized in one or two systems or dispersed throughout the realm. The advantages of economy of scale and defense favor one or two massive facilities, while increased overall survivability and reduced societal impacts might argue for more and smaller yards. The higher the spaceyard efficiency and throughput, the greater it would be seen as a threat. In the case of historical Venice, the Arsenale shipyard effectively deterred potential adversaries. A strong case could be made that if forced into war with Venice one should have begun by attacking the Arsenale itself. From Corvus to Keyhole, it's all about the shipyards. It always has been. 2) The warship ordered by the Japanese was the battle cruiser Kongo. The more-or-less blank check contract with Vickers essentially called for the fastest and most powerful ship in the world. According to various sources (including Richard Hough and Janes Fighting Ships), it created great consternation in Britain. This was because it was being constructed within sight of several clearly lesser battle cruisers being built for the Royal Navy, inviting easy and dismaying comparisons. As a consequence, the last pre-WWI Royal Navy battle cruiser class (the "Splendid Cats") were progressively altered during construction to the point that the last (HMS Tiger) ended up an entirely separate class. Japan would go on to build three more Kongo's domestically and then build the rest of the navy that fought in World War II. "The loss of output in Prince of Wales' case might, in fact, have been much greater had it not been for the energetic measures taken to remedy defects before, during and between the different engagements." "The presence in each turret of one of Messrs. Vickers Armstrong's erecting staff was of the greatest assistance." 4) Battleships USS Pennsylvania (BB-38), USS Maryland (BB-46), USS Tennessee (BB-43), and USS Nevada (BB-36) had already departed Pearl Harbor. 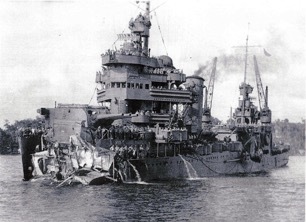 USS California (BB-44) and USS West Virginia (BB-48) had been refloated and were well under repair. A great many other ships, including auxiliaries, destroyers, and cruisers had also been repaired and returned to service. 6) Due to their origin, the Royal Navy originally named the four monitors: General Ulysses S. Grant, General Robert E. Lee, Admiral David Farragut and General Stonewall Jackson. The USA asked they be renamed—perhaps to make the Neutrality violations less public—and the Royal Navy complied. 7) Because of their U.S. origin and assembly line production, the submarines were commonly called (to neutral U.S. embarrassment) "Ford Submersibles." 9) Norfolk Naval Shipyard employed over forty thousand workers during World War II. The scale for spaceyards would likely be one or more orders of magnitude greater, given that much of the material would probably be refined and fabricated there, not simply finished and assembled. That is, the complex would also include the equivalent of Bethlehem Steel, General Motors, General Electric, etc., as well as provide accommodations, residences, and all the other facilities necessary for sustained human habitation. 11) It is worth noting that space mining should easily be able to yield the raw materials necessary for Honorverse navies. For example, the Solar System asteroid 16 Psyche appears to be comprised of enough nickel-iron to build over one hundred million of Weber's superdreadnoughts. 12) Outsourcing the mining, etc. to other star systems would certainly be possible but the infrastructure demands would still remain. Additionally, it would add the need for building and operating a separate interstellar merchant fleet dedicated to carrying a great many megatons of raw materials and parts. 13) Australian tennis player Rod "Rocket" Laver is the only individual to win the tennis Calendar Year Grand Slam twice. Laver, a wiry southpaw, was once described as an unimpressive body hanging from King Kong's left arm. Similarly, a shipyard on the scale of Hephaestus risks turn a thriving star system into little more than a shipyard support operation. 14) Spoiler Alert—in Mission of Honor the enemy begins with shipyard attacks, precisely as an enemy of Venice might have initiated hostilities by attacking the Arsenale, only the vacuum of space means all the skilled workers and technicians have nowhere to flee.